Function: Clears heat, brightens the eyes, benefits the throat, calms the mind, expels wind and scatters cold. Indications: Toothache, sore throat, swelling of the submandibular region, numbness of fingers, febrile diseases with anhidrosis, xerostomia, loss of consciousness. Function: Clears heat, dissipates pathogenic heat, disinhibits the throat. Indications: Blurring vision, epistaxis (nosebleed), toothache, sore throat, febrile diseases. Function: Dispels exterior wind, clears heat, brightens the eyes, benefits the throat. Function: Dispels exterior wind, releases the exterior, stimulates the dispersing function of the Lungs, stops pain, removes obstructions from the channel, tonifies Qi and consolidates the exterior, harmonizes ascending and descending functions. Indications: Headache, pain in the neck of any part of the body, redness, swelling and pain of the eye, epistaxis, nasal obstruction, rhinorrhea, toothache, deafness, facial swelling, sore throat. Function: Expels wind, releases the exterior, benefits the throat, stops pain. Function: Opens the Lung water passage. Function: Clears heat, stops pain, expels wind, benefits the throat. Function: Dissipates wind and clears heat, frees the channels and relieves pain. Indications: Abdominal pain, borborygmus, pain in the elbows and arm, motor impairment of the upper limbs. Function: Courses the channels and quickens the connecting vessel, frees bowel Qi. Function: Removes obstructions from the channel, tonifies Qi. Function: Expels exterior wind, clears heat, cools blood, resolves dampness, regulates nutritive Qi and blood, benefits the sinews and joints. Indications: Sore throat, toothache, redness and pain of the eye, scrofula, urticarial, motor impairment of the upper extremities, abdominal pain, vomiting, diarrhea, febrile diseases. Function: Courses the channels and quickens the connecting vessels, disinhibits the joints. Function: Removes obstructions from the channel, brightens the eyes, resolves phlegm and disperses masses. Function: Disinhibits the throat and clears Lung Qi. Function: Benefits the throat, relieves cough, resolves phlegm and disperses masses. Function: Diffuses Lung Qi and clears Lung heat, clears the nose and rouses the spirit. Treating disorders in the head area, specifically disorders related to disruptions in the energy of the Large Intestine meridian or the Stomach meridian. Balancing the energy of any area that lies along the meridian or its secondary channels, especially in the head area. Healing the heart of ailments caused by disruptions in the Large Intestine meridian or Stomach meridian. Empowering the lungs with regards to their treatment of bodily fluids. Like all meridians, the Large Intestine meridian is not isolated to merely the line that connects the primary meridian points shown in the image above. The Large Intestine meridian also includes secondary energy branches that are not used for acupuncture needling but are important to consider when choosing which points along the meridian to needle, or to apply pressure to when using acupressure. Let's take a look at both the secondary energy channels and the sinews that are affected by this meridian. The first pathway is the Large Intestine luo-connecting channel. This secondary energy pathway begins at acupoint LI6 on the arm, where it first separates from the primary Large Intestine meridian line. It travels up the arm alongside the primary meridian, then goes up the neck and onto the face just like the primary pathway does as well. 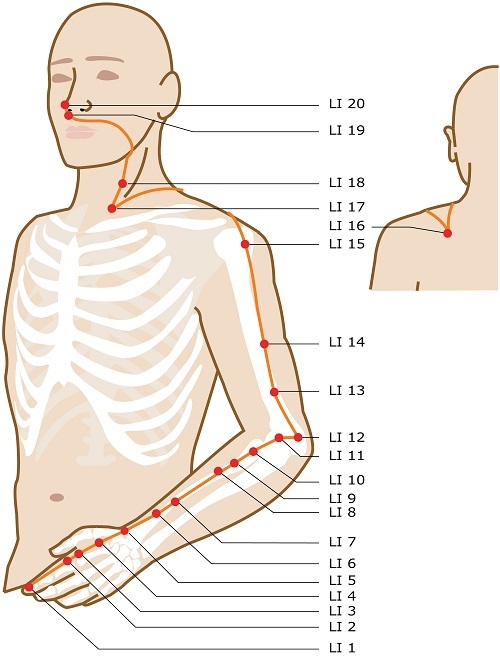 Near the wrist, this channel connects with the primary Lung Meridian before also passing through acupoint LI15 on its way up to the neck and head. On the cheek, the channel divides into two branches. One branch goes forward and inwards to connect to the teeth, whilst the other branch goes backwards to the ear where it connects with the secondary channels of several other meridians that also reach the ear. The next pathway is the Large Intestine divergent channel. This energy channel begins on the hand, where it separates from the primary Large Intestine meridian. It travels up the arm where it passes through acupoint LI15 of the primary meridian points, just like the luo-connecting vessel. It then runs across the shoulder and into the spine itself. From the spine, the channel separates into two and goes both upwards and downwards. The upwards portion goes up into the throat, where it joins with the Large Intestine primary meridian close to acupoint LI18. 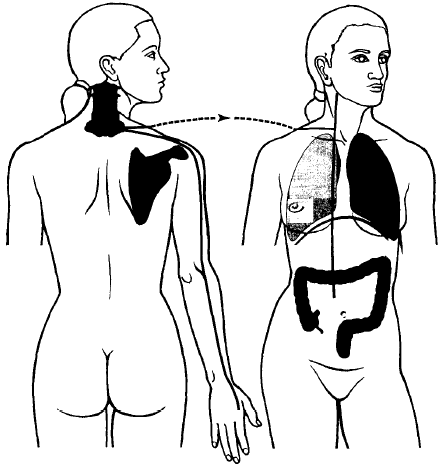 The downwards portion passes through and connects with the thorax area, including the lungs, breasts, and eventually the large intestine where the pathway ends. The final secondary energy area we will discuss is the Large Intestine sinew channel. The sinew channel is the area of muscle and tissue that are in the general vicinity of the Large Intestine meridian and its channels. These tissues will be strongly affected by the healthiness or sickness of the energy of the meridian. These sinews begin on the index finger, near acupoint LI1 where the primary meridian begins. 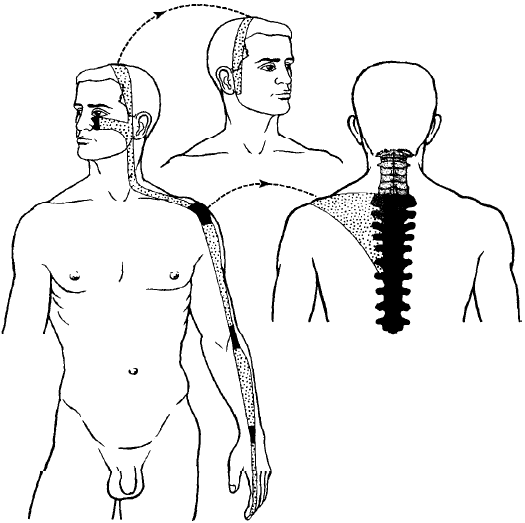 They follow the primary meridian up the arm, then up the neck, and onto the face. While travelling up the arm, the sinews bind at the wrist joint, the elbow joint, and the shoulder joint (meaning that the Large Intestine meridian can be used in acupuncture and acupressure to aid in healing or empowering these joints). At the shoulder joint area, the sinew path separates and a portion of it reaches backwards to cover the upper back, with a foucs on the upper spine. On the face, the sinew channel separates into two. One pathway goes under the eyes and binds at the side of the nose, whilst the other pathway crosses over the top of the head and ends in front of the ear on the other side of the face, where it connects with the jaw. The Large Intestine meridian can be used in acupuncture or acupressure to help improve the health of the tissue and muscles that lie along this sinew channel.